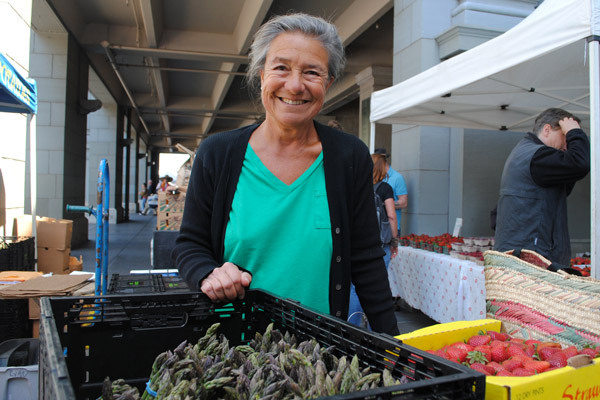 Patricia Unterman is the co-owner of Hayes Street Grill, a food writer, and one of the founding board members of the San Francisco Public Market Collaborative. You can find Hayes Street Grill at the Saturday market. The 1989 Loma Prieta earthquake shook San Francisco to its core and put the city into a funk. Tourism, our number one industry, collapsed. The Civic Center, the nexus of government and the arts, shut down as one building after another closed for retrofitting. Transportation was a mess. The whole freeway infrastructure was compromised, including the Embarcadero Freeway, a looming, double decker that ran along the Bay. It was finally torn down and hauled away in late 1991, exposing an expanse of pavement right in the middle of the Embarcadero at Market. This was when Sibella Kraus called me to ask if I was interested in a farmers market in San Francisco that would bring together farmers and restaurants and sell to the public as well. Sibella had invented the position of forager for herself at Chez Panisse, where she had been working as a line cook. She quickly gravitated to her true calling, agriculture, growing lettuces in Alice Waters’ backyard and searching out artisanal farmers and producers to supply the restaurant. She soon realized that the more restaurants she could enlist to buy from her farmers, the more sense it made for everyone. Organic and sustainable farmers who had to charge more than big conventional farmers would be assured of a market, while restaurants would get super fresh, high-quality produce, which was not that easy to find 20 years ago. She called this endeavor the Farm-Restaurant Project. With a regular urban-rural meeting place—like a farmers market—restaurants and farmers could get to know each other, collaborate on what to grow, and prepare for the arrival of new crops, all of which would enrich the city’s menus and stir public interest. Of course I said “yes,” eager to get something exciting going in the depressed City; and I joined a founding board, which Sibella put together with Tom Sargent, a public/private developer whose dream was to establish a market on a pier in the Bay. That proved to be more complicated than anyone imagined, so we got permission from the Port to open in the liberated expanse of concrete in the middle of the Embarcadero roadway. Sibella cajoled her farmers to come down. My restaurant, Hayes Street Grill, set up a breakfast booth to lure customers, and slowly the word got out that some beautiful seasonal produce was available—to everyone. Sibella’s goal was to promote relationships—real connections between farmers and urbanites. The more they understood each other and liked each other, the better it would be for both. The city dwellers would be seduced and nourished by the produce and demand more of it from a growing network of ecology-minded family farms that grew for flavor rather than volume. The working board was made up of farmers, restaurant people, environmentalists, architects, civic-minded citizens, urban planners and developers. We eventually called ourselves CUESA—Center for Urban Education About Sustainable Agriculture—but we all knew that the educational moment happened at the market when a kid bit into his first fig, a home cook discovered fresh shelling beans, or a chef started building menus on what she hauled off that day. Taste made the difference. The market’s vibrant fruits and vegetables were worth a higher price, a price that allowed these farmers to sustain both their families and their beliefs. Something else happened. A community formed around the market, a group of farmers and shoppers who came every Saturday rain or shine, who talked to each other, who became friends. The chefs formed a bond with each other, and everyone spread the gospel of the pleasure and goodness of mindfully grown produce and artisanal food. Chefs identified farmers on their menus so when their patrons fell in love with a plate of Savoy spinach, they started coming down to the market to get some themselves. For once, rural and urban people developed an experiential bond. When the post-earthquake reconstruction of the Embarcadero got underway, the market moved to a parking lot just north at Green Street, and when the Ferry Building was renovated, the developers begged us to move our market there. We did, and our farmers market put that building on the map. In turn, the iconic location gave our farmers a wider audience. Thousands of people from all over the world get to experience the products of a sustainable food system. But the moment of belief still happens the same way, when someone experiences a dry farmed tomato, a fragrant strawberry, or tender sugar snap peas, and begins to wonder why all produce doesn’t taste like that.